To date we are half way through our National Stroke awareness campaign. • 11 Major league Strike Out Stroke events across the country. • Over 600,000 fans have heard the F.A.S.T. message at their local baseball stadium. • Over 50 stroke centers/hospitals have been involved. 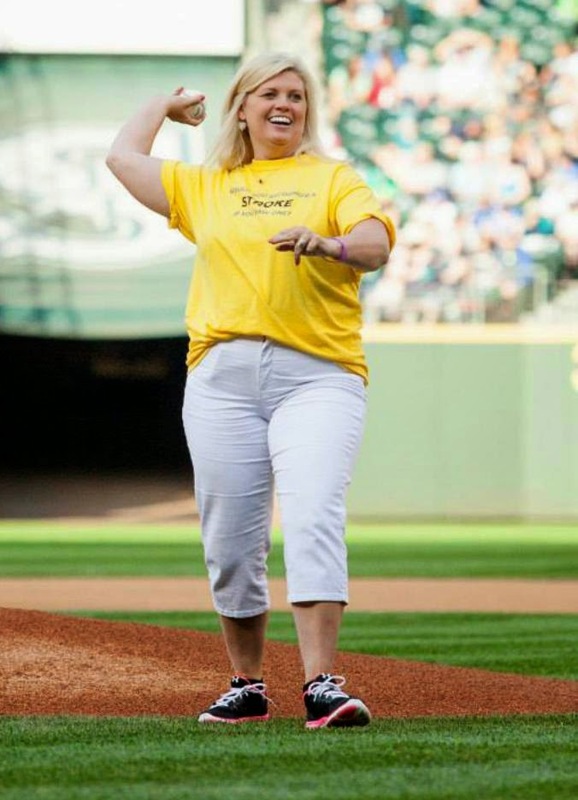 • 11 first pitches’ thrown by stroke survivors of all ages!! • Over 500 hundred volunteers across the country have “stepped up to the plate” to Strike Out Stroke! • Thousands of F.A.S.T message T-shirt's and magnets are now being worn and hanging on refrigerators across the country!!! Thank you Genentech, because of you we are Striking Out Stroke and saving lives! 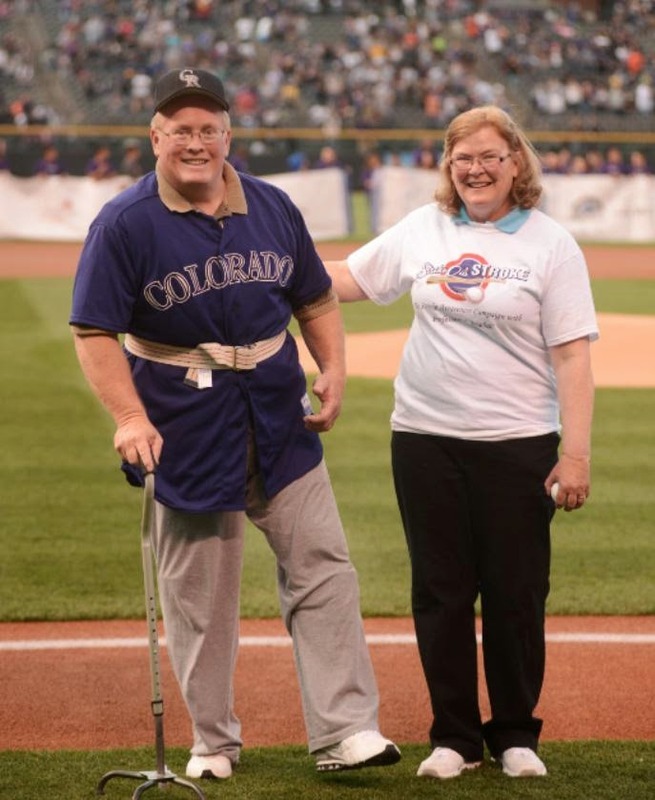 Professional Baseball, SOS is a national campaign raising awareness about the warning signs and risks of stroke. Strike Out Stroke Days are fun, impactual events presented at Major and Minor League stadiums, educating thousands of people about the symptoms of stroke through an increased awareness of the FAST concept. the fear of not succeeding at something, hold us back from trying. new stroke survivors and their caregivers. 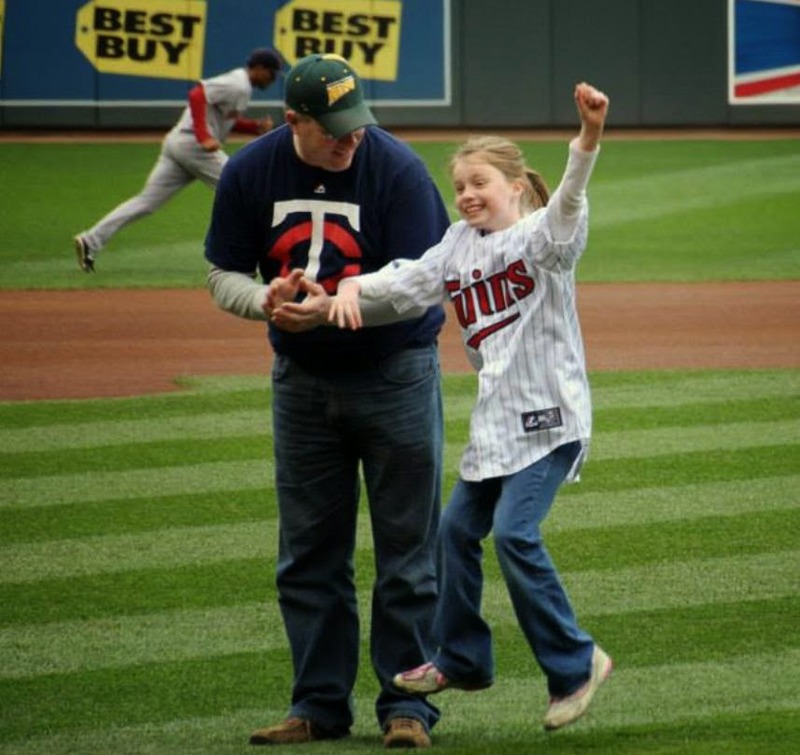 educate baseball fans about the FAST symptoms of stroke. In addition to major league baseball, there are numerous Strike Out Stroke™ events across the country in minor league communities. For more information, explore www.strikeoutstroke.com and be sure to “like” Strike Out Stroke™ on Facebook. 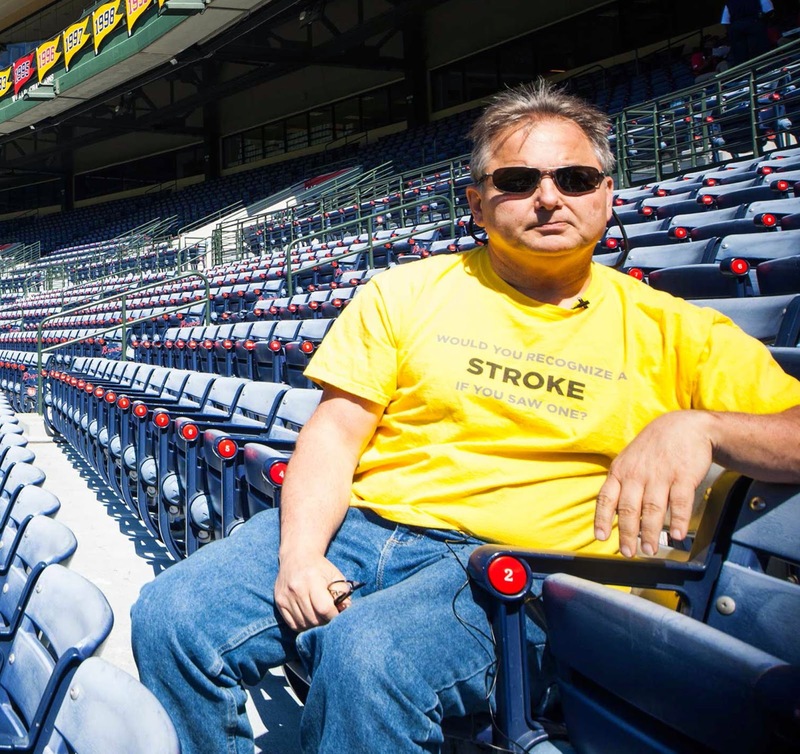 For questions and interests in sponsoring a Strike Out Stroke™ event in your community, contact Larry Schaer, Associate Director at 1-866-688-5450 or larry@strokecamp.org. Through working together, we can Strike Out Stroke! Strike Out Stroke™ is a division and registered trademark of Retreat & Refresh Stroke Camp. And, the list is still growing! Boy, exciting things are happening for Retreat & Refresh Stroke Camp! The camp season has started and we’ve had a blast with the 50’s Rock ‘n Roll theme. Everyone seems to know at least some of the music from that era. Hula hoops, bubble gum, saddle shoes, and car hops help us to really rock it out this year. This year we will complete 20 camps which will bring our total since that first camp in 2004 to over 100 ! It is also exciting to report our overwhelming success with the Strike Out Stroke events that have been held already this year. These events allow us to get the F.A.S.T. message out to the masses (see related article in this newsletter). We have 11 down and seven (7) to go. We hope to grow these events even more next year. Finally, I am thrilled to report that our corporate office has moved. We have found new office space where everything will be under the same roof. For several years, we have had things in four different places around town. When preparing for our camps, it requires going from place to place in order to gather all we need. Having everything under the same roof will be amazing. For the time being, our mailing address will remain the same. We have lots of work to do before the camp season gets crazy busy, but it will be well worth it. Next newsletter we will post some photos, especially Lauren near her window, the biggest criteria for our new space! Now introducing the 2014 line of Stroke Camp and Strike Out Stroke™ merchandise! The Stroke Camp merchandise this year is a zip-up hoodie in your choice of either white or light steel. Hoodies are $40 for S-XL and $45 for 2XL and 3XL. We will be bringing the zip-up hoodies to each of the camps to sell; however, order now if you want to guarantee your size and color. Order yours today at www.strokecampshop.org. Fifth Grade Education - On June 1, we had our annual Strike Out Stroke game with the Peoria Chiefs. It was a great success! There were EMS personnel on hand, as well as many stroke survivors and caregivers. Fans in attendance received FAST magnets, cards, and stickers, and throughout the game, were educated on how to recognize a stroke. The winner of our fifth grade stroke poster contest, Slade Mulvaney from Beverly Manor in Washington, IL flew in the OSF LifeFlight helicopter, landed in centerfield, and threw out the first pitch of the game! Survivors made up the Dream Team and got to go on the field prior to the start of the game. We would like to extend a big thanks to Genetech, a Member of the Roche Group for their help in sponsoring this event. Each time the Chiefs struck out a Cougar in the businesses respective inning, that business donated $50 to Retreat & Refresh Stroke Camp! Stroke is the fourth leading cause for death in the United States, cutting short the lives of over 133,000 people each year. It ranks as the number one leading cause of serious, long-term adult disability. There are definite steps you can take to prevent or at least reduce your chance of experiencing a stroke. Should a stroke occur, there are steps you can take to minimize its long term effects and improve your recovery. Retreat & Refresh Stroke Camp is committed to teaching the public about stroke and, in turn, improving outcomes through their knowledge of the appropriate action to take. Retreat & Refresh Stroke Camp, headquartered in Peoria, Illinois, has designed and developed an educational tool called The Stroke Learning Center to promote stroke awareness and education. This tool consists of six ten-inch electronic tablets containing a quiz targeting the most important and frequently asked questions pertaining to stroke awareness. The Stroke Leaning Center is usually set up in conjunction with the MegaBrain exhibit at pro baseball games, convention centers, shopping malls and other similar venues. It is the goal of The Stroke Learning Center quiz is to raise awareness through the answers to questions which in turn, educate the public on ways to minimize the chance of getting a stroke, how to recognize the onset of its symptoms, as well as how to reduce its long term effects should such an event occur. The Acronym F.A.S.T. often used in National Stroke Association venues and many other organizations working with stroke issues is also used throughout the quiz to help the quiz taker recognize and remember these signs. The current version of The Stroke Learning Center quiz is presented in English and Español, and consists of fourteen questions designed to raise awareness. It also offers preventative measures so participants learn how to recognize the symptoms of a stroke and the appropriate response. Each question offers five possible answers that are presented on a touch screen ten inch tablet. The quiz taker touches the answer that they think best answers the question. Once the question is answered correctly, the next question appears. Even selecting the incorrect answer is a learning experience because any answer chosen results in a detailed explanation. And now a glimpse into just how The Stroke Learning Center App works. The first screen gives you a choice of which language you wish to use. Currently, only English and Espanol are available. Often, depending on the event attended, the participant is awarded a stroke related gift after completing the quiz. Also included with the quiz is an app for the presenter to use to obtain aggregate statistical information on how the quiz takers did on that particular tablet. This information can be used by the exhibitor to determine which questions were answered incorrectly the most often and which incorrect answers were chosen. This will help the presenter determine where more emphasis should be placed in educating the public. Click on the red words for more detail from the AARP site. New research indicates that if older adults want to lower their risk of getting a stroke, one of the best things they can do is eat more high-potassium foods. That would be things like baked potatoes with the skin, cooked spinach, orange juice, bananas, yogurt, acorn squash, raisins and beans. People whose diet contains plenty of these foods may be less likely to suffer a stroke than those who get little of the mineral, according to a recent study reported in the journal Stroke. The Swedish researchers analyzed 10 international studies involving more than 200,000 middle-aged and older adults. An even larger analysis, published last year in the British Medical Journal, found a similar effect: A higher potassium intake decreased stroke risk by 24 percent in people with high blood pressure. All that was needed was an extra two to three servings of fruits or vegetables a day. High quality evidence shows that increased potassium intake reduces blood pressure in people with hypertension and has no adverse effect on blood lipid concentrations, catecholamine concentrations, or renal function in adults. Higher potassium intake was associated with a 24% lower risk of stroke (moderate quality evidence). These results suggest that increased potassium intake is potentially beneficial to most people without impaired renal handling of potassium for the prevention and control of elevated blood pressure and stroke. In the Swedish study, researchers found that stroke risk decreased as people’s reported potassium intake went up. For every 1,000 mg. increase in daily potassium, the odds of suffering a stroke in the next five to 14 years dropped by 11 percent. A second Swedish study examining the relationship between stroke risk and potassium in older women found similar results. Published in the American Journal of Epidemiology, it found that among women ages 49 to 83 with a history of high blood pressure, a lower risk of stroke was linked to a diet high in potassium. The lead researcher in both Swedish studies, Susanna C. Larsson of the Karolinska Institute in Stockholm, says the findings don’t prove that it’s potassium alone that produces the positive effect, because high-potassium foods are generally healthy ones, “but (the findings) strengthen existing evidence that it might,” she told Reuters. Potassium is an electrolyte needed for maintaining the body’s fluid balance and is involved in blood pressure regulation. Potassium’s effect was specifically linked to a reduced risk of ischemic strokes, the ones caused by a blockage in an artery to the brain. Ischemic strokes account for about 80 percent of all strokes. The U.S. Department of Agriculture’s dietary guidelines recommend that adults get 4,700 mg. a day of potassium from food. The average American, according to some nutrition surveys, gets only about 2,600 mg. Some people need to be careful about potassium, however, including those with kidney disease, or who are on certain blood pressure drugs. Talk to your doctor. Acorn squash, cooked, 1 cup: 896 mg. Baked potato with skin: 844 mg. Spinach, cooked, 1 cup: 838 mg.
Lentils, cooked, 1 cup: 731 mg.
Kidney beans, cooked, 1 cup: 713 mg.
Split peas, cooked, 1 cup: 710 mg.
Sweet potato, baked: 694 mg.
Butternut squash, cooked, 1 cup: 583 mg.
Raisins, 1/2 cup: 553 mg.
Avocado, 3 ounces: 540 mg.
Yogurt, low-fat, plain, 1 cup: 531 mg.
Halibut, cooked, 3 ounces: 490 mg.
Cantaloupe, 1/4 : 412 mg.
Rainbow trout, farmed, cooked, 3 ounces: 382 mg.
Orange juice, 3/4 cup: 355 mg. Milk, low-fat, 1 cup: 348 mg. Broccoli, cooked, 1 cup: 332 mg.